The architectural design process generally begins with a rough sketch, sometimes on a napkin or note pad, but most often on tracing paper, which allows for layering and rapid adjustments. Sketching is gestural: quick, searching lines of varying dimension that seek to define shape and form. As the process continues, lines can become more deliberate and thoughtful as schematics become dimensional with the introduction of color, value and perspective to create three-dimensional form. Michael Prodanou graduated with a degree in Architecture from the University of Toronto and went on to work with the prestigious architectural firm, The Architects Collaborative, designing work for clients all over the world. After leaving TAC in 1976, to establish his own practice, his firm worked on commercial and residential projects in the Mid-East, Europe, Canada, and the USA, including consulting for the US State Department. In 1999 he sold his practice and began, in earnest, to draw and paint the figure. For the past 20 years he has investigated the human form through a variety of mediums. This exhibition displays what could constitute a “sketch” of Prodanou’s voluminous body of work executed over these past two decades. His dedication to expanding his vision through countless drawings sessions with models and his transformation of these works into a unique hybrid of drawing/painting/collage serves as a testament to his passion for discovery. This search echoes that foundation established as an architect: the use of line to transform, discover and expand one’s subject. 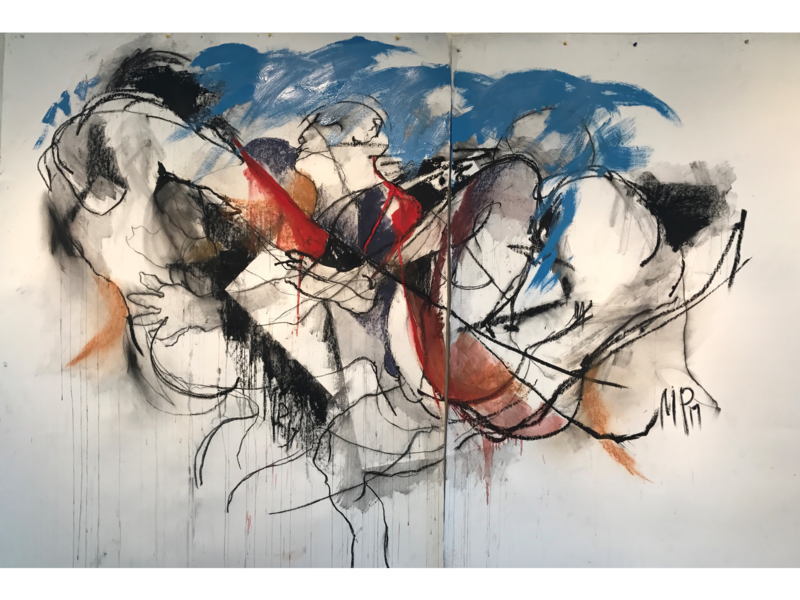 Michael Prodanou has created works that explore the notion of what line, color and shape can do in the service of the human figure. It brings us to the image of the body as a repository for the struggle to be human. Michael Prodanou was born in Toronto, Canada of Greek immigrant parents and graduated with a Bachelor of Architecture degree from the University of Toronto. He traveled, worked, and lived in Europe and Africa for four years before joining The Architects Collaborative in Cambridge, MA. Ten years later he started his own architectural office and established a small international practice of commercial and residential work. He sold his practice to his employees in 1998. Prodanou began drawing and painting figures in oil shortly thereafter in Provincetown, MA, where he lives and has a studio. He has taken painting workshops at the Fine Arts Work Center in Provincetown with Cynthia Packard, Jim Peters, and Bert Yarborough. He admires the work of the German Expressionist painters Ernst Ludwig Kirchner, and Karl Schmidt-Rotluff, and the West Coast figurative painters David Park, and Nathan Olivera. He has taught drawing workshops called ‘Fearless Figure Drawing’ in Provincetown and Florida. Bert Yarborough has a degree in Architecture from Clemson University and an MA and MFA in Photography from the University of Iowa. He formerly held the Sonia C. Davidow ’56 Endowed Chair in the Fine and Performing Arts at Colby-Sawyer College, New London, NH, where he also served as the Director of the Marian Graves Mugar and William H. and Sonja Carlson Davidow ’56 Art Galleries and taught Drawing and Painting. He currently holds Faculty Emeritus status at the college. A former two-year Resident Fellow at the Fine Arts Work Center in Provincetown, MA, he served as Visual Arts Program Coordinator for four years and is now serving as Chairman of the Visual Program Committee. He has received two NH State Arts Council Grants in Painting, an NEA Fellowship in Sculpture, and a Fulbright Fellowship to Nigeria, also in Sculpture. He is a recent recipient of a Visual Arts Residency Fellowship from the Civitella Ranieri Foundation in Umbria, Italy.